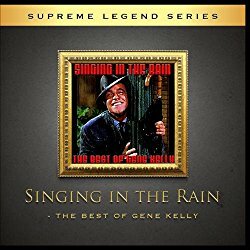 This Singing in the rain classic old movies song and dance tune was performed by Gene Kelly in the 1952 movie of the same name. It remains the #1 musical all-time and the song is listed at #3 of the top 100 songs in American cinema. These Classic Old Movies pages will all be written about my very favorite musicals and movie theme songs that I have enjoyed over the years. Some are not listed in the top 100 musicals by the American Film Institute but I have the option of replacing some of their choices with a few of mine. The Singing in the Rain lyrics was written by Arthur Freed and published in 1929. The musical stars Gene Kelly, Debbie Reynolds and Donald O'Connor. Kelly has always been one of my favorite actors and I enjoyed his acting because he always played likeable characters on screen. He could act, dance, sing, was a film director, producer, and choreographer. Singing in the Rain classic old movies review. My favorite review of the "Singing in the Rain" movie was by a man named Michael O'Connor. I have never met Mr. O'Connor but he said it best and echoed my thoughts as I read his review. "To my mind, the most magical sequence EVER filmed was Gene Kelly's inspiring dance in the rain from "Singing in the Rain." Though you knew it was "just" a dance sequence by a talented hoofer in a movie, Kelly's joyful, masterful performance convinced you that, here indeed, was a man who had just fallen in love. Every gesture, every step brimmed with seemingly spontaneous exuberance and goodwill. When he swung from the lamppost and that huge smile spread across his face, you just knew magic was in the air." This is a fun movie for me because of the great song and dance routines, but I especially enjoyed the choreography on this song. The video below is a perfect example of Gene Kelly's amazing dance talent. Continue below and follow the links to these wonderful old movie favorites. Moon River - Is this the best song ever written for film? Grease - From 1978 - Coolest movie of the year! Don't over look this Elvis Cool Classic dance routine in - "Jailhouse Rock"
He is the Yankee Doodle Dandy - James Cagney at his best. American Graffiti - Is this the best teen movie ever? The Trolley Song - Judy Garland - "Meet Me In St. Louis."